A quick note before we begin - for each phone we've calculated an Endurance rating after 15 minutes and after 30 minutes of charge. 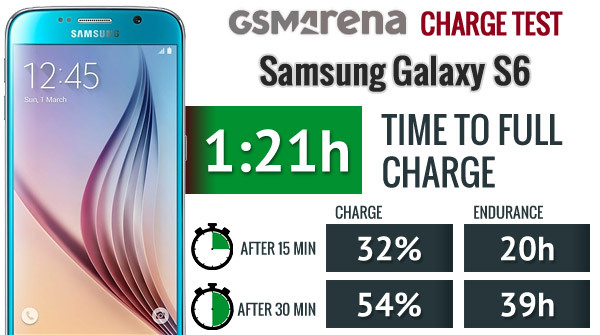 This assumes the phone starts at 0% charge and is calculated based on our traditional Endurance rating scaled according to how much charge is in the phones battery after the allotted time. Also, we calculated the three other numbers - talk time, web browsing and video playback. As with the regular Endurance rating these numbers represent the maximum the phone can last under the specific workload. Samsung's Galaxy S6 duo went back in battery capacity. The flat-screened Galaxy S6 has 2,550mAh, the price to pay for its thinness. Samsung ships it with an Adaptive Fast Charger, which puts out 5V/2A to regular devices or 9V/1.67A to supported devices. 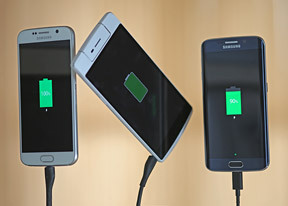 The Galaxy S6 reached full charge in 1 hour 20 minutes. 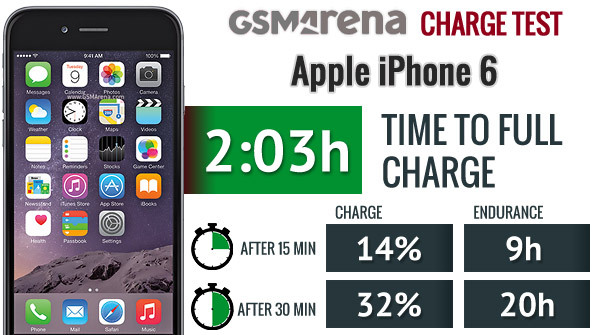 After 15 minutes of charging, it can do over 5 hours of 3G calls, 3 hours of web browsing or 3 hours of video playback. While it has a smaller battery, the Galaxy S6 is pretty efficient so less charge lasts longer. 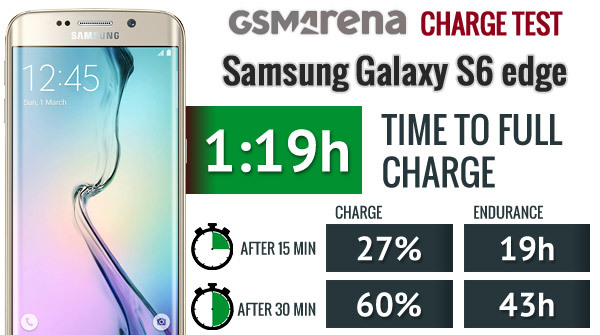 The Samsung Galaxy S6 edge has just 50mAh more battery capacity, but it's charging behavious was slightly different. It was a little slower at first, but caught up and even overtook the Galaxy S6 halfway through. Still, considering the similar charging speed and identical endurance rating, the benefit from 15 minutes of charge is almost identical - over 5 hours of talking, 3 hours of web browsing or 3 hours of video playback. The Apple iPhone 6 has the smallest capacity battery in this test - just 1,810mAh. Apple also doesn't have an official fast charging solution, so we tested with the charger that came in the box (5V/1A). After 15 minutes you can get about 1 and a half hours of calls, a bit less of web browsing and less still of video watching. The HTC One M9 supports Qualcomm's Quick Charge 2.0, but HTC ships it with a regular 5V/1.5A charger. Penny pinching from the manufacturer doesn't impress consumers when they are paying for a flagship product, but we still decided to test if you should invest in a better charger. 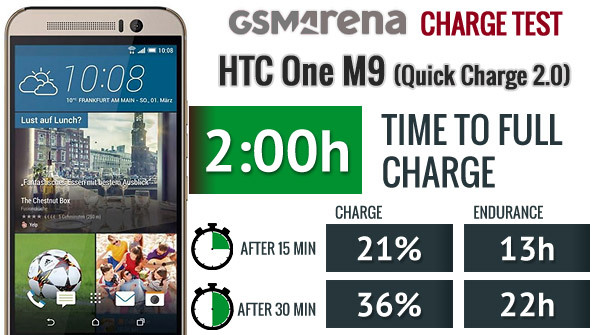 We first tested the One M9 with the charger it came with and then switched to a more powerful charger. The box charger took 2 and a half hours to push the battery to 100%, after 15 minutes you can barely eek out 2 hours of calling, under an hour of web browsing or under an hour of watching videos. 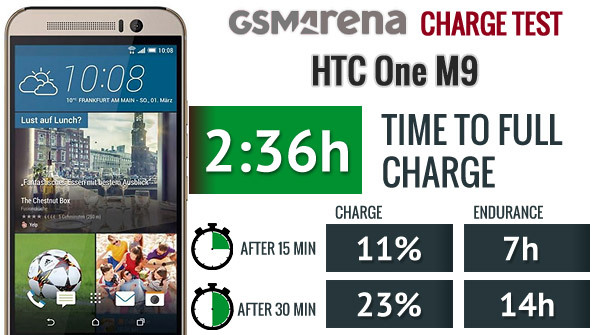 With a Quick Charge 2.0 compatible charger, though, the HTC One M9 completes the charging process almost 40 minutes faster. It also handles quick top ups much better, filling a third of the battery in half an hour. We expected even more from a QC2.0 device, though, the Galaxys finished at least half an hour quicker and had a lot more in their tank after 30 minutes.